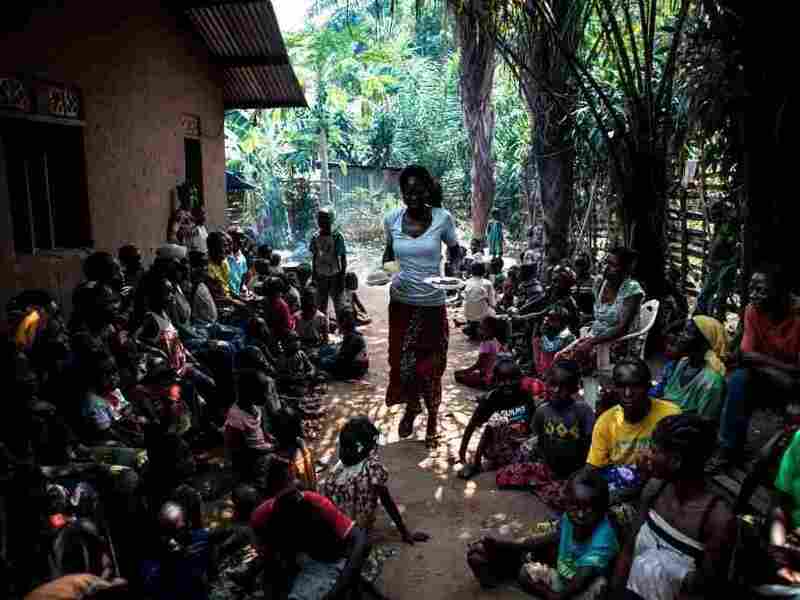 Report: More Than 3,000 Killed In Violence In Central Congo : The Two-Way The violence in the Kasai region erupted last August when the military killed a local chief. The Catholic Church reported the death toll, and the U.N. says the situation there has grown more complex. A volunteer brings daily food rations for people who fled the conflict in the Kasai region earlier this month. They are at a camp for internally displaced persons in Kikwit, Democratic Republic of Congo. More than 3,000 people have been killed in a remote region in the Democratic Republic of Congo, according to a new report from Congo's Catholic Church. "Congo's Catholic Church says the army, seeking to put down the insurrection, destroyed ten villages. The church also accuses the Kamuina Nsapu militia of killing hundreds of people, destroying four villages and attacking church property in its anti-government campaign." This comes as the U.N. human rights chief issued a new report on the violence there, describing "extremely grave, widespread and apparently planned attacks against the civilian population in the Kasais." Zeid Ra'ad Al Hussein said U.N. human rights investigators recently deployed to the area and found that the situation has grown "much more complex" and more deadly. At the same time, he said, Congolese authorities have failed to protect civilians and have attempted to curb international involvement in investigating the crimes. "Refugees from multiple villages in the Kamonya territory indicated that the Bana Mura have in the past two months shot dead, hacked or burned to death, and mutilated, hundreds of villagers, as well as destroying entire villages. My team saw children as young as two whose limbs had been chopped off; many babies had machete wounds and severe burns. One two-month-old baby seen by my team had been hit by two bullets four hours after birth; the mother was also wounded. At least two pregnant women were sliced open and their foetuses mutilated." He adds that 42 mass grave sites have been found in the region – and warns that there may be more. Hussein is calling for an independent international investigation. A government spokesman told The Associated Press that the government plans to issue a separate report on the crisis. "Beyond verifying whether these figures are true or not, it demonstrates that this is a real security situation that must absolutely lead to an appropriate government reaction to put an end to this," Lambert Mende told the wire service. In March, as NPR has reported, the bodies of two U.N. employees were found in the Kasai region. U.S. citizen Michael Sharp and Swedish citizen Zaida Catalan were there to investigate the increase in violence. As Ofeibea reports, this is happening amid broader political turmoil in the country: "The violence in restive Kasai fueled existing political tensions in Congo, prompted by Joseph Kabila's decision to stay in power beyond his December 2016 two-term presidential limit."